The massive KDP Print Migration is underway, and I noticed pricing differences straight off. While they initially infuriated me, once I gathered all the data I became much more mellow. I put my short stories (8,000-12,000 words) in print, primarily so that comparative pricing makes the ebook looks cheap. Maybe folks won’t pay $0.99 for a short story in ebook on its own, but they will pay $2.99 for that same ebook if there’s a print version for $5.99. I don’t expect anyone to buy my shorts in print; that’s not what they exist for. I consider those folks who do buy them hard-core fans, though, and I try to make them as nice as possible. Print books are a little easier, though. I feed PDFs into the system, let it compute print costs, and twiddle the retail price until I make just over $1. With the CreateSpace shutdown, though, I’m really noticing pricing differences. Let’s look at the first short I converted. The first Prohibition Orcs story was priced at $5.99 in print via CreateSpace, for 100 5×8 pages of orcish bootlegging. That gave me a profit of $1.44; perfectly reasonable. I fed that into IngramSpark, and was rewarded with a net of $0.61. First off, it’s clear that IngramSpark smokes CSED–especially when you consider that CSED pays everything in US dollars. It’s also clear that KDP Print’s European net is lower than CreateSpace’s. Once I impose that requirement on CSED/IngramSpark, everything gets more expensive. So while it initially looks damning, there’s no cause for outrage. Annoyance at losing margin on EU sales, yes. The question is, what do I do with this information? The obvious thing to do would be to price print books differently by channel, but online price-matching is rampant. The cheapest price I set in a currency is the real price I’ll be paid for. I’m not willing to give my work away. My decision is, I’m not going to migrate most of the short stories to IngramSpark. My best-selling shorts will go on IngramSpark, but that’s it. What about larger books? Let’s check out my nerd cozy mystery git commit murder. While I should revisit the pricing in light of exchange rate changes, the comparison should still make sense. The difference between CSED and IngramSpark really shines on larger books. I make a penny more in the UK, and less in the EU? Uh, okay, fine, I guess. Before someone asks why I make more on novels than short stories, it’s because 1) they took longer to write, and 2) bookstores make their money based on the sale price. A bookstore won’t handle a book unless they can make a few bucks off it. A book like git commit murder or FreeBSD Mastery: Specialty Filesystems has a narrow audience, and cutting the price to $0.99 is not going to improve my sales. IngramSpark is definitely improving my sales. 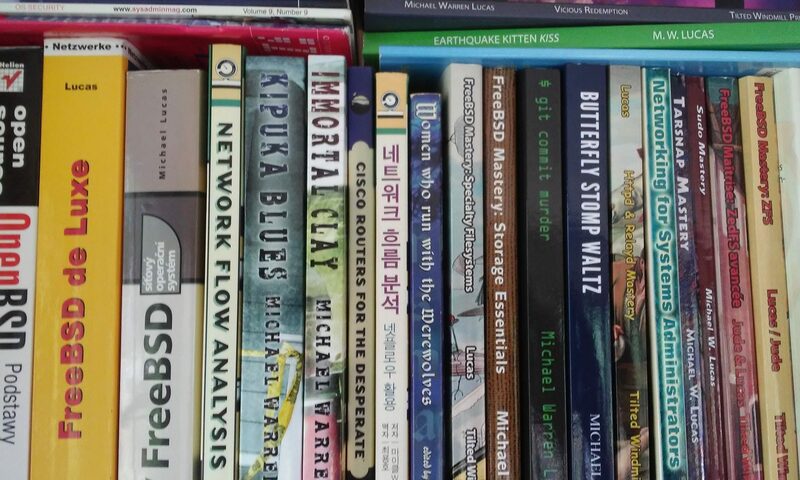 I’m selling print books through third parties in Asia and Australia, which I never really managed before. I’m being paid more for sales that would have gone through CSED. Additional IngramSpark sales have already paid back what I spent for a thousand ISBNs. I have only a small subset of my titles fully through their system so far, so I’m hopeful that’ll increase when the rest grind through. The truly annoying thing about all this: CreateSpace and IngramSpark both use the same printing machinery, at the same companies. The different prices are entirely business decisions. I’m not declaring that my lower net on CSED books was absolutely Amazon’s attempt to discourage availability of my print books outside their ecosystem, but my lower net on CSED books was almost certainly Amazon’s attempt to discourage availability of my print books outside their ecosystem. On the plus side of this migration: the Prohibition Orcs books have spiffy redesigned covers. I am well pleased. And the first one is only $0.99 in ebook. Collections can do well when they’re themed. Sadly, I don’t write in any organized way, so… when I have five themed, there’ll be another collection.